I missed another post, I’ll explain. With Nancy and Andrea safely off to Leon this past Thursday morning, Heike and I started the short 14 kilometer hike to Sahagun. Our strategy was that we knew Friday would be our longest hiking attempt so far – 30 kilometers, so we figured an easy walk on Thursday, get good rest for the two longer days ahead. 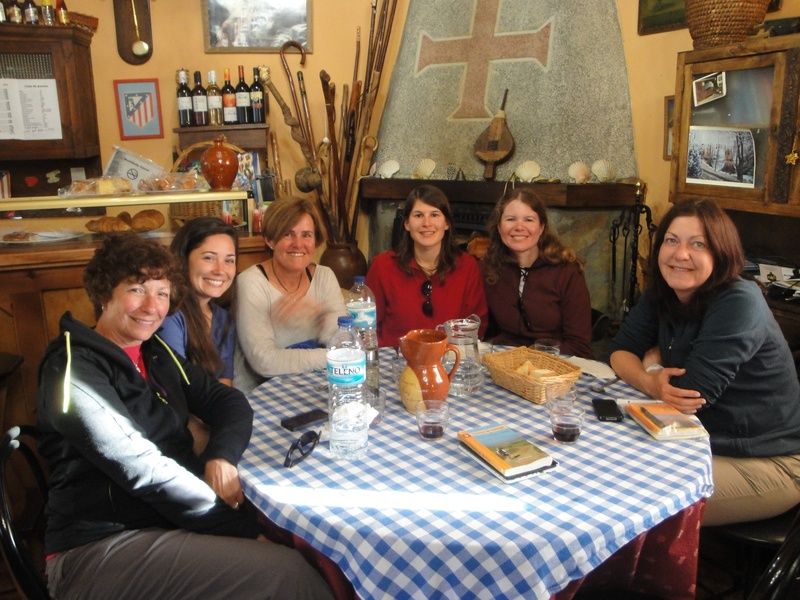 As it is with Camino friends that last at least a few day, one gets to know of the life of the other. We have discussed nearly every topic imaginable. One of the topics has to do with the German language. Heike has been able to help me a lot with improving my German and helping me understand a lot of the nuances of the German language. One example is that in German, a man who is not very “manly” is known as a “soft egg” or a man “who can only take warm showers.” We arrived in Sahagun late Thursday morning and registered at the Monasterio de Santa Cruz which is a convent of Benectine nuns. It is run by volunteers of a Madrid association. This is a large, beautiful old building which is very clean. However, I quickly found that it was very cold. One thing I’m also quickly finding is the uncanny spirit that I’m finding on the Camino. I don’t think it’s coincidental all the little “signs” I’ve been seeing along the way. A few days ago when walking on the Roman Road for more than 15 kilometers of wilderness we approached the village of Caldadilla de la Cueza which appeared to be a ghost town. By the way, that’s typical of the many villages we walk through. No sounds and no one in sight. It looks like a movie set. Anyway, Nancy, Andrea, Heike and I are walking through this village needing to stop for a cafe con leche and some rest. Heike ask’s “where is there a bar in this town?” and just as she asks that we notice for the first time on the Camino we see writing on the street that doesn’t become apparent for a few more steps. It has the words painted “B A R” with an arrow pointing to turn left! So the routine has been when you check into your alberque or hostel or hotel, you bath, wash your clothes and rest or sightsee in the village. My room in the monastery, though immaculate is like walking into a refrigerator. I get into the bath tub to take my shower and wouldn’t you know… there’s no hot water! I start laughing and thinking of what Heike shared with me only hours before….. “real men take cold showers”. The Camino! It teaches and teaches! Well, the challenge was on. I wet my body, soaped up, and rinsed. Just as I was finishing rinsing, the water became warm! However, I proved that I was not a soft egg or a man who only takes warm showers! Friday morning Heike and I started on our long day’s trek to Reliegos which is 30 kilometers away. There are options to get to this village. One way, which is easier on the feet and knees is along the Roman Road instead of walking parallel with the highway. We opted for the Roman Road. We veered away from the path most people were taking and went toward the village Calzada de Coto. Another ghost town with not a soul, cat or dog in sight. We then found a fork on the road. No yellow arrows or scallop seashell waymarkers which is extremely rare along the Camino. 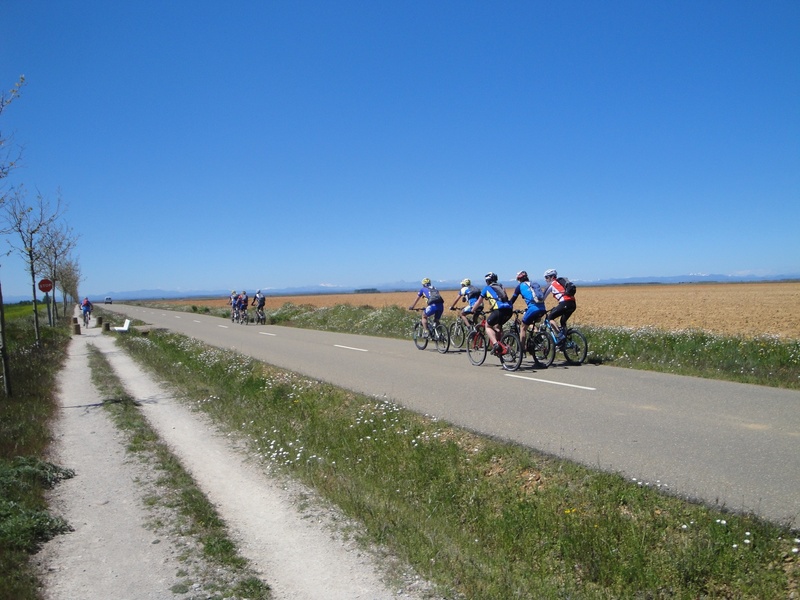 One sign leading left said “Camino Frances” while the other pointed to a place that was not on our map. We ARE on the Camino Frances so we went left. We walked and walked and walked. No yellow arrows. We then saw a sign on the ground pointing left again toward a bridge that would put us back on the highway path we were trying to avoid. We continued forward and walked and walked. The dirt path we were on lead right to a dead end in front of a forest! Oops! Not good! We turned around and started backtracking. We stopped and looked at our map again. On the map, it shows that the Roman Road has a bridge that goes over railroad tracks. We scanned the horizon. At a distance along the horizon we saw what looked like a bridge but was it over railroad tracks? We looked all around trying to decide if we should back track to the village we left a while ago with the fork on the road. If so, how sure were we that the bridge we saw was really over railroad tracks. Just then, we saw a passenger train streaming along the horizon heading right toward the bridge! The spirit of the Camino really is alive! Heading back to the village with the confusing fork we saw 3 people coming along the same path as us. They too used the same rationale as us. They turned out to be Germans. Heike explained to them that this road led to a dead end. We all then decided to take the sure path and walked toward the road that took us back to the highway. The path is is much harder on the feet and knees. We took our first break at Bercianos del Real Camino for a cafe con leche. Refreshed, we headed to El Burgo Ranero for lunch. A mere 7.6 kilometers away. At El Burgo we had an excellent lunch. We left for Reliegos thinking it was only 12 kilometers away. We were dead wrong. By now, we’re developing a good sense of how long it takes to walk 4 to 5 kilometers. We’ve now been walking 8 days in a row. Every crest we went over, every turn around a bend in the road, we were expecting Reliegos. No Reliegos. We kept walking, Fortunately, the weather was spectacular. Not a cloud in the sky, gorgeous blue heaven, and snow capped mountains framing the northern horizon. We stopped. Drank water, ate a few bites of chocolate and almonds and walked on. We finally passed a landmark that was on our map. An airfield to the south. 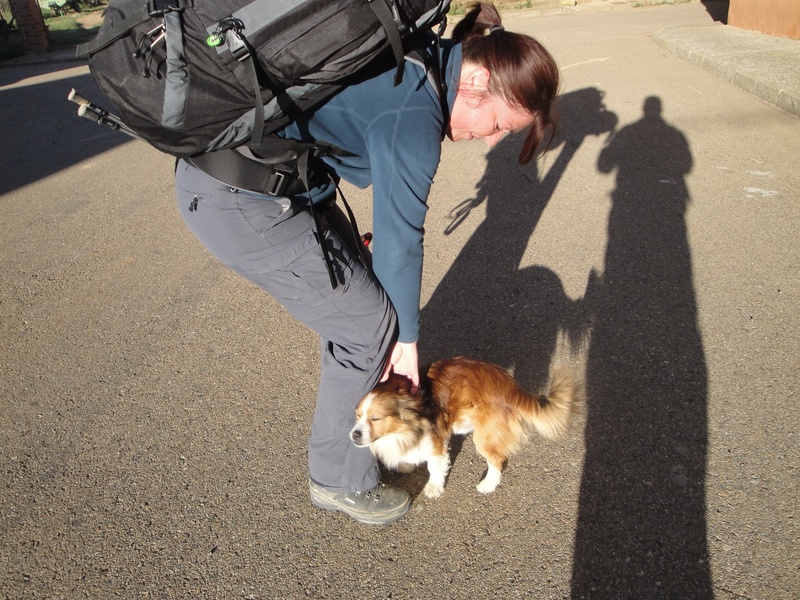 By now we were very tired, Heike’s blistered feet was causing pain. My knee started to bother me. We kept on. We encouraged each other, making each other laugh. Reminding ourselves that all the pilgrims who stopped for the day at the previous village are a bunch of “soft eggs” and that only champions hike to Reliegos, Out of no where we saw two Spanish workers putting together an irrigation canal. I asked how far are we to Reliegos? The both responded in unison, “4 to 5 more kilometers.” They had to be joking! We’ve already walked what seemed like 30 kilometers already. As we walked away, Heike said, “I hope those men don’t have a good sense of distance.” We laughed again and talked about gallows humor. Germans have that too! 5 kilometers away we reached Reliegos. Exhausted. Feet aching. Knees swollen. We checked into the La Parada Alberque. It is a very new alberque. We checked into the room and went to the patio to rest a bit before we found a place to eat. More than 30 years ago while serving in the US Air Force I was assigned to Hahn Air Base, Germany. Since I was a boy I always wanted to visit Germany. I have been fascinated with the richness of German culture and its contributions to science, music, literature and theology. My three years in Germany was a wonderful experience in which Nancy and I made good friends and lasting, positive memories. Most Germans may not be as quickly, demonstrably affectionate as Latins but I can assure you, my experience in Germany taught me that when you make friends in Germany they are as caring and generous as anyone you’ll ever find. We went to the patio to rest our weary feet. There were a group of Germans sitting together. We didn’t know them except that we had seen them along the Camino. One of them, Horst, walked up to us and asked if we’d like a bowl of noodle soup. We said yes. Within a few minutes they had us at their table sharing the food the made for the day and the wine they bought. It was a wonderful way to recover from our long day’s walk. After talking to them we realized that we had walked 40 kilometers that day! That’s nearly 25 miles! I hope I can recall their names but these wonderful, generous and friendly Germans reminded me of the Germany I knew. Thank you Horst for your generous offer of soup when we needed it most. Thank you Renate, Natasha, Dieter and Volker for your hospitality! Heike and I took our bathes walked to the nearest Alberque/Restaurant that was still open and as we were entering the Alberque, we saw standing at one of the balconies, Liz and her daughter, Celina from Naples, Florida. We met them a few days ago and have been meeting up with them, by chance?, the last few days. They had already eaten but joined us as we ate. It was a very nice finish to a very long day. We arrived at Leon today at 1130. Meeting Nancy and Andrea at the hotel we’re staying at was an absolute treat. I missed them very much. We’ll stay in Leon for an extra day of rest before resuming our Camino. We hope to join Heike this evening to watch the European Championship Cub between Dortmund and Bayern Muenchen. First time two teams from the same country playing for the title! We’ve reached Leon! 164 kilometers done. 336 to go! Buen Camino! 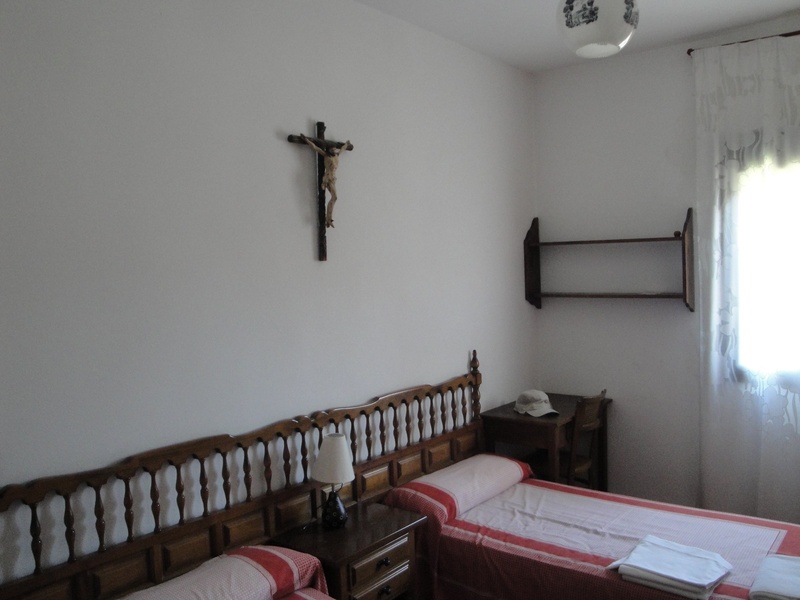 My room in the Monastery in Sahagun. 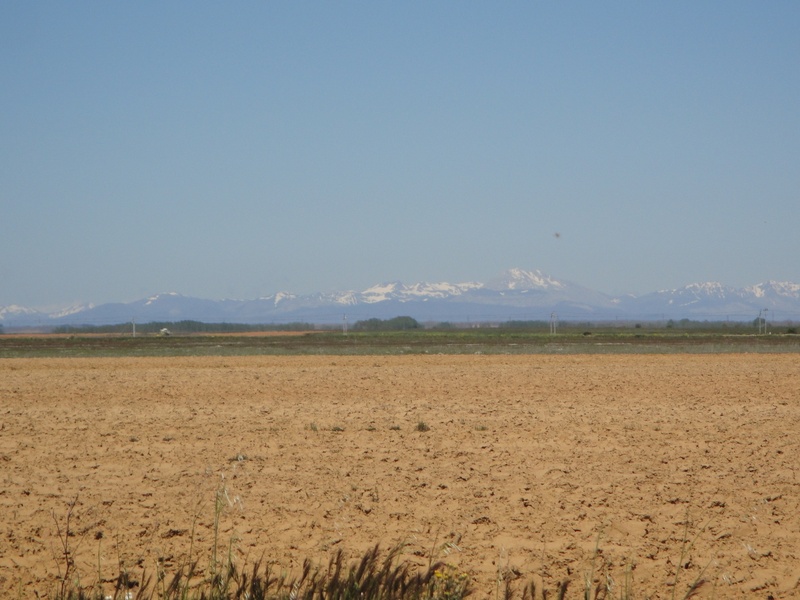 The beautiful Spanish Meseta with snow capped mountains along the northern horizon. 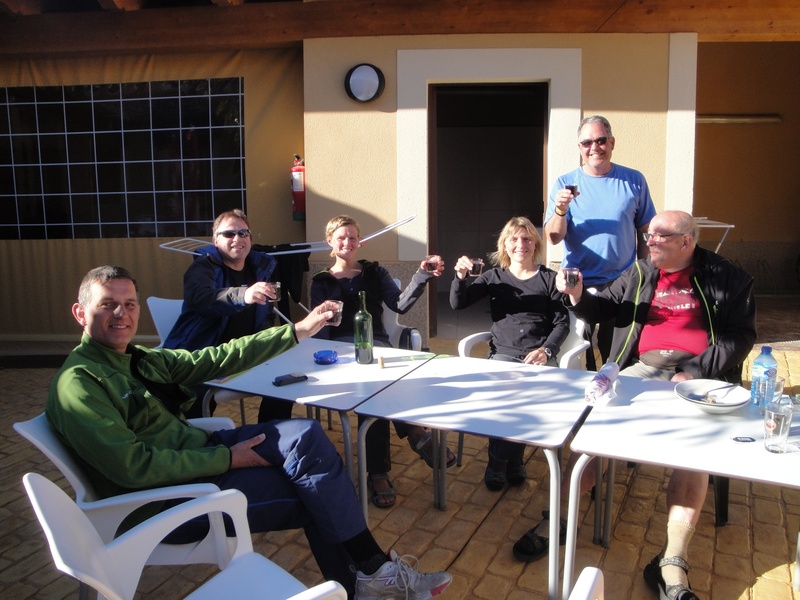 The friendly and generous Germans who perfectly capped our long 40 km day – Volker, Dieter, Natasha, Renata, and Horst. 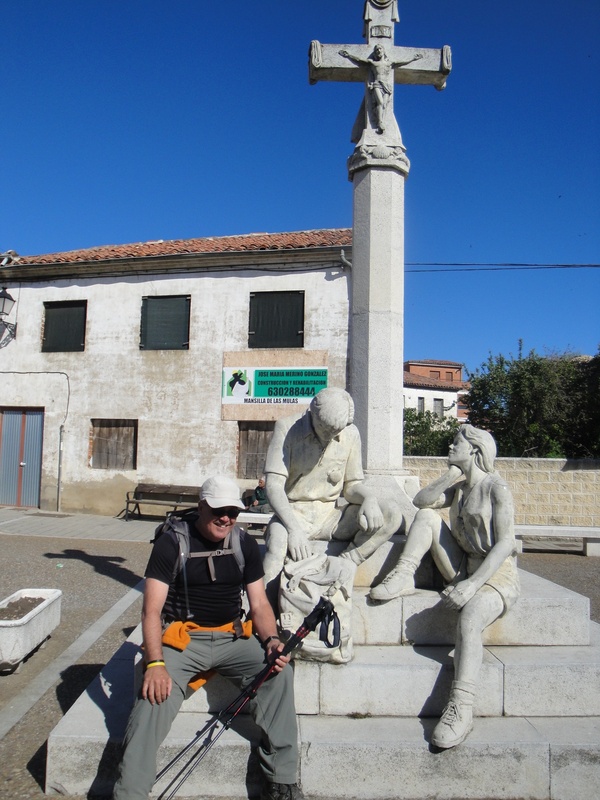 A modern statue paying homage to weary pilgrims on the Camino. Thank you again for your lovely post. So glad you are now reunited with Nancy and Andrea. I am very much enjoying your writing and photos. Way to go, Joe!! You sound like you are doing great!! May God grant the three of you good health on the next stages of your Camino!! Wow, Wonderful story. A life time of skills being brought to bear on the success of a difficult task. Nice to read and even more fun to see the pictures. Hi Dan and Kelly! I’m grateful that you’re enjoying the blog and sharing it with others. I’m being challenged and learning everyday on the Camino. Like life, it’s how I respond that makes all the difference. We are looking forward to going to Mass today at the Leon Cathedral. It is an absolutely spectacular building with one of the finest collection of stain glass windows of any church in the world. Tonight, we are also planning on watching a concert and choral performance by the U. of Notre Dame Glee Club at the Cathedral! We resume our Camino tomorrow morning. All our best to you, Kelly and Catherine. Buen Camino! What an adventure. You are tough. How are Nancy’s knees doing? Way ro go. You are toigh. Jow ia Nancy feeling ? Praying for all of you ! Jose, thank you for your prayers. We need them! Hi Jose, I know what you mean! I haven’t completely learned how to manage my iPad and all of my text has been without the Spanish accents so there are a lot of spanish words I write are incorrectly spelled because of that, like your name Jose without the accented “e” and Leon without the accented “o”. Glad to hear you are better. Enjoy today.